this day in crime history: may 18, 1927 | Nobody Move! 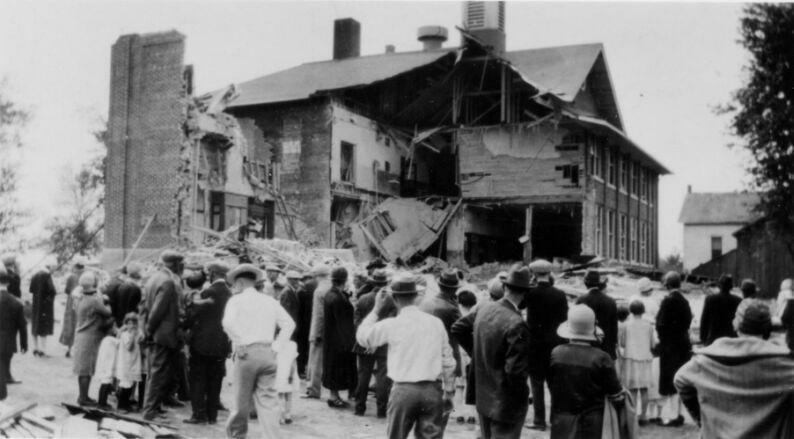 On this date in 1927, Bath, MI became the scene of the largest school mass-murder in U.S. history. The massacre began when school board member Andrew Kehoe became upset over an increase in the school tax that he blamed for his financial ruination. Kehoe began by killing his wife and detonating fire bombs in his farm buildings. While firefighters worked to put out the fires on Kehoe’s property, Kehoe went to the Bath Consolidated School, where he detonated bombs he had previously planted in the school. Kehoe left the scene after the explosion, but returned a short while later. He saw the school superintendent standing outside the school watching rescue and recovery efforts and called to him. As the superintendent approached the car, Kehoe detonated a bomb inside the car. The blast killed Kehoe, the superintendent, two local men, and an 8 year old boy who had managed to escape the school bombing. The Bath School Disaster resulted in 45 dead and 58 injured. In 1975, a park dedicated to the victims was built on the former site of the school. Bat-sh*t crazy people don’t come any more dangerous than this one (imho). A lousy school tax increase caused his financial ruin? That makes NO damn sense at all. The tax increase was nothing more than a convenient excuse. I have a feeling this guy was gonna blow no matter what. It wouldn’t take much to trigger a guy like that. I don’t like school tax increases either, but seriously? I just vote no and leave it at that!